I wanted to tell the tale of this redesign to show how we did it, together as a community, and also to give kudos to the many folks who pitched in and made it happen. 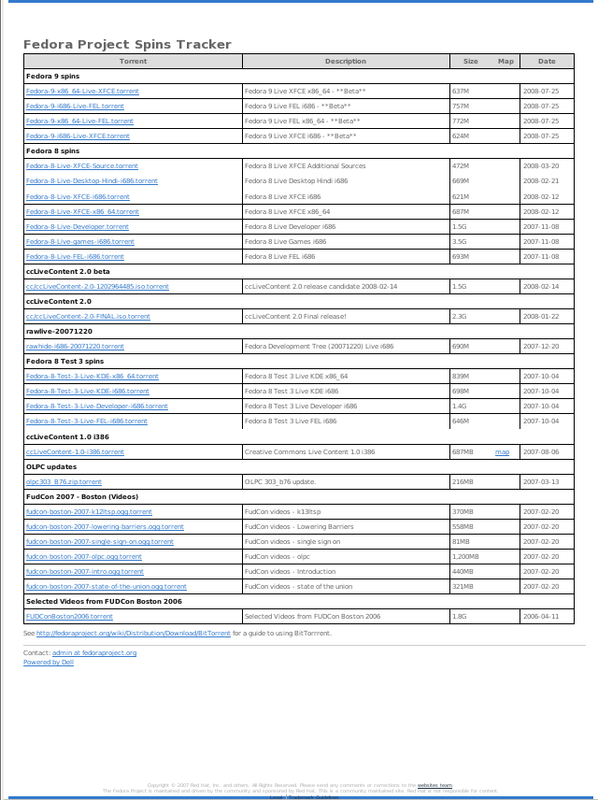 Paul kicked off a discussion on fedora-advisory-board list back in July. The goal was to initiate a close examination and improvement of the Fedora download experience. The Fedora Board asked myself and Ricky Zhou to figure out what we could do the help the website towards this goal. Ricky and I met with the Board and we kicked off the redesign process at the end of July. I asked the Board to specify requirements for the redesign, mentioning who the target audience for the redesigned pages was, and who the target audience was not. Mel created a wiki project page to serve as a central place to store the documents and mockups related to the redesign project. The Board came up with the requirements and target audience information as requested and Paul wrote them up on the wiki. Paul was in Boston for a few days, and we sat down with a whiteboard and later Inkscape and a projector and came up with some initial mockups for a cleaner http://www.fedoraproject.org experience that I posted to Planet Fedora on August 8. We received a lot of great feedback on these mockups (thank you!) and took a lot of the feedback into account, iterating the designs. An initial spins mockup idea was posted to Planet Fedora on August 11. Again, we got tons of great feedback that was rolled back into the mockups. During the fedora-advisory-board list discussion on the mockups, we ran a survey on how folks get Fedora to help inform the design work. 78 people took the time to fill out the survey! 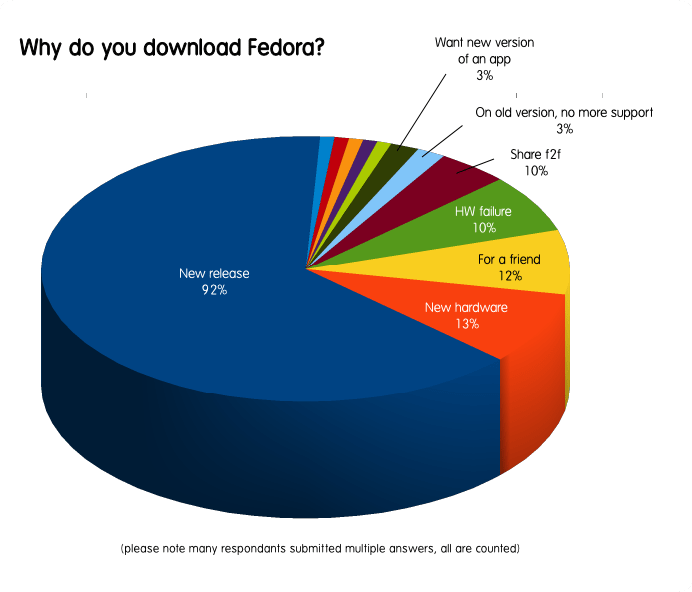 It helped us understand why, how, and when folks download Fedora, and which Fedoras they prefer to download which was good data for the redesign. Rex shared his concerns about the www.fpo mockups and their implications for the KDE Desktop spin. 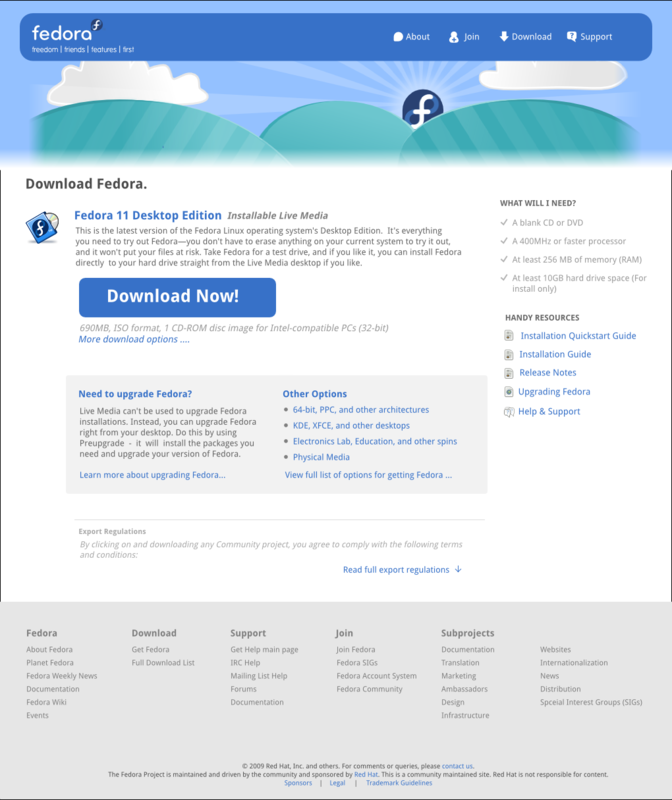 This resulted in various changes in the initial design – 16 iterations to the get.fedoraproject.org page design, resulting in a nice, clean, single download-button page design that still offered plenty of opportunity to drive traffic to spins.fedoraproject.org. As a result of this discussion, too, the Board agreed that the spins.fedoraproject.org redesign needed to be prioritized higher than the get.fedoraproject.org design. Since the new get.fedoraproject.org design was de-emphasizing spins, those spins would need a nicely-designed home first so the links to them weren’t lost. By September 18 I had an initial cut of what the spins site would look like. I got some great feedback on those as well, and felt like we had a pretty solid idea of what spins.fedoraproject.org was going to look like. With the spins.fedoraproject.org design’s path made more clear, I went back to the get.fedoraproject.org to make sure it was meeting the Board’s requirements and also accounting for the KDE SIG’s concerns. On October 5 another iteration of the get.fedoraproject.org mockups was posted to Planet Fedora. These introduced a new tabbed “More Options” area that provided links out to the spins.fedoraproject.org site. Shortly after on October 8, we hit up the Spins SIG to help us get content put together for each of the spin details pages on the new spins.fedoraproject.org site. (several reminders were posted to Planet Fedora as well. 😉 ) The Spins SIG is a great group of people to work with. They quickly put together wiki pages for their spins content which we used to populate the text and screenshots in each spin’s page. Jaroslav Reznik stepped up and managed this for the KDE spin. Sijis Aviles began completely rocking out the implementation of the spins site. I have to say, Sjis is a rockstar, TAKE NOTE. He put together cleanly templated pages that were true to the mockups, made sure everything was set up for localization, and made sure the various features (rotating banners and features) worked and got some assistance (thanks Seth!) to put together the top 5 downloaded spins widget and made sure it happened. Without him, this redesign would not have happened. On October 28 my initial designs for the Spins banners were posted to Planet Fedora and shared with the Spins maintainers. Changes were made and posted on Nov 1 based on community feedback. Next major kudos goes to the Fedora Design team. They totally rocked out. I posted a desperate plea to the design team mailing list for help in putting together screenshots for the many games in the Games spin. On short notice, we got 99 screenshots for the Games Spin, with more on the way. Kudos to Charlie Brej, Patrick Connelly, Hisham Abdel-Magid, Hector Gomez, and Ryan Lerch who all pitched in! We missed the string freeze for get.fedoraproject.org and that redesign ended up getting pushed back to post-F12, since the complication of managing two different themes/styles on the websites was too much in the time we had. But look for those changes coming soon. The site went live this week – thanks to Ricky for helping us push the site out on F12 release day! That link is incorrect. 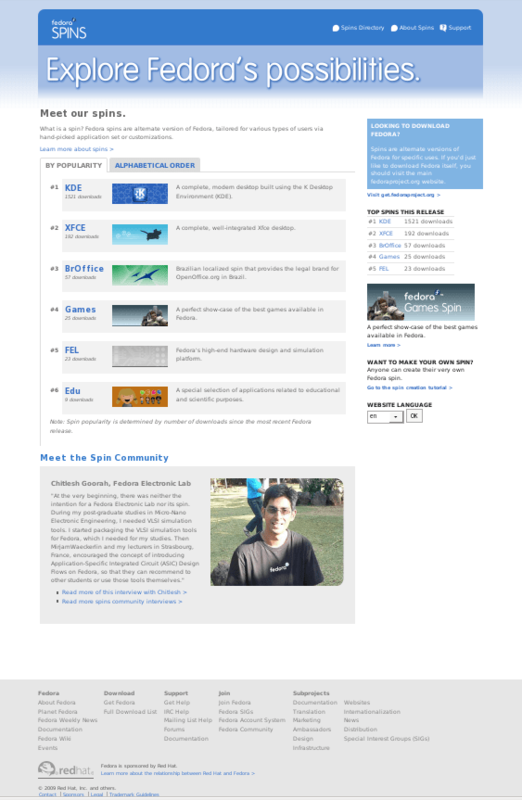 I think we should push out the new look for get.fp.o much before the Fedora 13 release. Trying to do it just before release makes things get pushed out further, again and again. A couple of weeks from now, would be a very good time, me thinks. Thanks I fixed the link! A couple weeks from now isn’t going to happen 🙂 But maybe 6-8 weeks is doable. I agree though, after having get.fpo, spins.fpo, and Fedora Insight all synced up with F12’s release date, it was just not possible. It was too much work all at the same time. So I’d like to see us get the new fpo design out well before F13. Couple of weeks or six weeks doesn’t matter particularly. My point was that: don’t do it now because everyone is downloading Fedora 12 and a screwup would have a large impact. Don’t do it just because Fedora 13 release because again,a screwup would have a large impact. Somewhere in between is fine. For the KDE page on spins.fp.o, would it be possible to also somehow mention the mirror links in the Download tab? But I know this would be a special case for the KDE spin only (the other stuff on spins.fp.o doesn’t get mirrored), so if this is too much work for the one spin, I’ll accept that. I just think it’d be nice to offer the option. Sure, what are the mirror links? I’d be happy to get them added. Thanks for offering the historical retrospective on the websites redesign – this is a great “how things work in Fedora” story. Since we’re going to have to go through a similar process to finish up the rest of the websites (as you and the others above have pointed out already), is there anything else about the process (other than “avoid last minute everything-at-once workdeath”) you’d like to change? I know for FI, I’m going to try to assign individuals to host worksprints (instead of assigning individuals to simply do tasks) so we can get things done together faster – many hands make light work, and it’s also just more fun.